My face was glued to the window all the way from the airport. 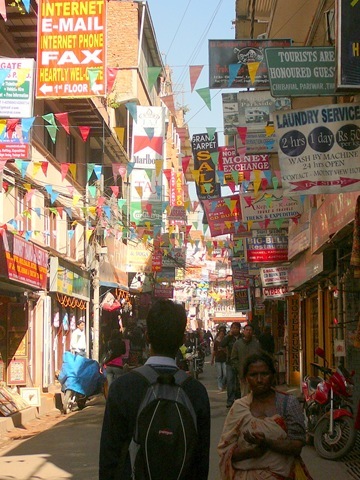 We had finally arrived on the sub-continent and I was eager to see all the craziness. Kathmandu did not disappoint. The traffic was as crazy as I expected – our hotel owner later told us that there are no traffic rules in Nepal – basically just stay to the left and don’t hit anything. Cars, trucks, motorcycles, scooters and bicycle rickshaws are everywhere – if the lane is wide enough for handlebars then a motorcycle will surely be speeding down it. The smog is unrelenting – at times blocking out the views of the Himalayas. My nose is already constantly running black and there is a thickness in my throat. Many people, locals and tourists, sport masks to try and minimize the damage. The noise is overwhelming – honking seems to be a national sport and it pays to heed them as more than once we almost got swiped by a passing motorcycle. Whistles, salesmen hawking, music and general noise round out the ‘symphony’ – it starts early, and ends late. The colors are amazing – the dresses that the women wear, the ever-present marigolds and red dye at the temples, the bright lights of all the signs overhead – a never-ending smorgasbord of things to see. The food is delicious – we love curry and a little heat – every meal we have had has been great…we’re in culinary heaven. It is fascinating. We spent the entire first day just wandering around, our heads swiveling back and forth as one sight after another vied for our attention. We visited two temples during our stay. 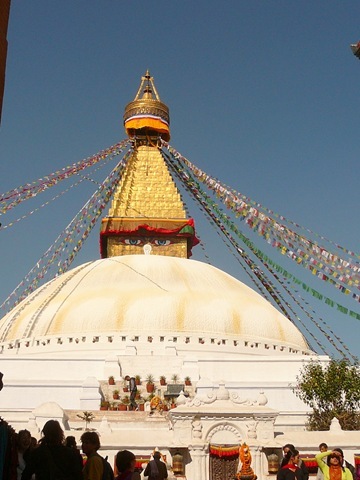 The Swayambhunath Stupa is also known as the Monkey Temple due to the troop of monkeys that also live on the hill. But they were not the highlight that day. We arrived at the stupa to find a mix of Buddhist and Hindu ceremonies occurring. Circumambulating the stupa and turning the prayer wheels is distinctly Buddhist, but the other shrines and ceremonies using marigolds, red dyes, bell ringing, and rice were definitely Hindu. 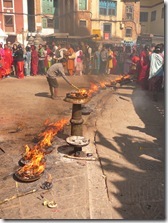 To which religion the rafts of yak butter candles and pots of fire to be stirred by devotees belonged to, I don’t know. There was much merriment and celebration with red-smudged foreheads and marigold petal strewn hair everywhere. It was amazing and we watched for hours as we circled the stupa again and again to take it all in. The Bouhda Stupa is one of the largest in the world and surrounding village is home to a large population of Tibetan monks and exiles. The feeling here was definitely more serene and in keeping with what I had thought a Buddhist temple would be like. The sounds of Tibetan meditation music floated out from the music shops around the stupa, and the scent of incense permeated the air. We, again, slowly circumambulated the stupa (always in a clockwise direction) and watched as the crowd built towards sunset. 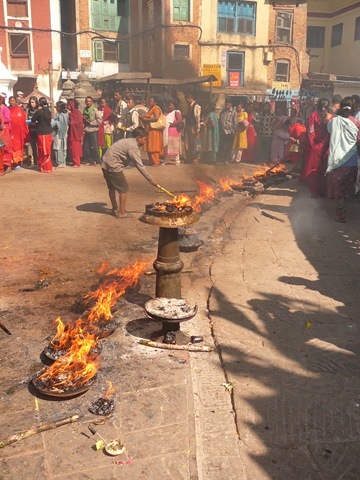 By the time the sun set the path was filled with devotees, monks, villagers and tourists – a religious and social event. After just two days in the Nepali capital our heads were filled. We headed off to Pokhara and the mountains for some natural beauty and peace and quiet. That sound a little overwhelming. Jealous about the food, not so much about air you can’t see through. Have fun, and heed the honking. I just love your blog! I’ve been following your posts since South America…and my husband and I have been planning our own RTW trip while I follow yours! We leave in 6 weeks, and we’re circling in the opposite direction. We’ll hit India just after you guys leave India…I’m really looking forward to your posts! Love this one about Kathmadu since we are also spending a few weeks in Nepal. My all time fave post of yours was Petra, Jordan- it made me so glad that we included that as part of our trip too! Happy travels and thanks for the fascinating reading and pictures! Awesome! Envious – looks fantastic! I have been following your blog from the beginning and have to say you are doing an amazing job!! While allowing us to experience the adventure you and Jason are on, you are opening our eyes to so much more of the world…places we know very little, if anything, about.